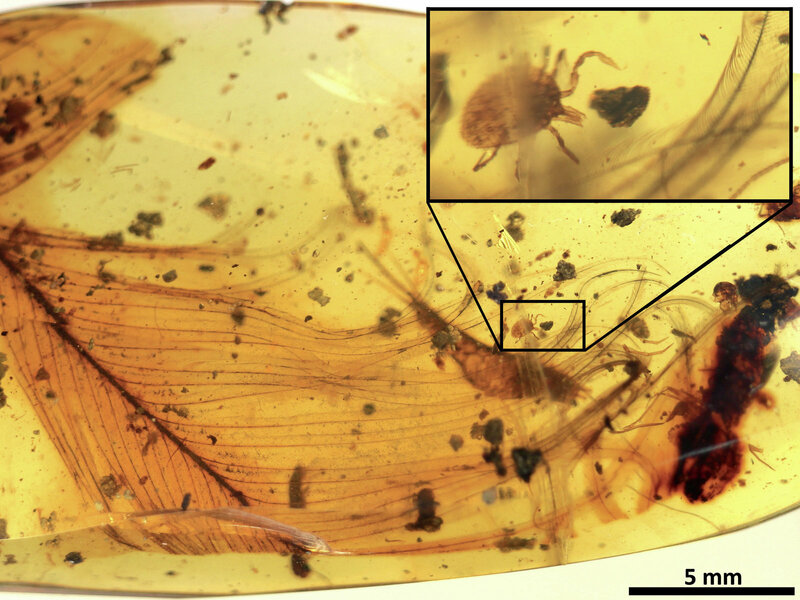 Amber-Trapped Tick Suggests Ancient Bloodsuckers Feasted On Feathered Dinosaurs, a new study suggests. Modern ticks are infamous for biting humans and other mammals. But ticks are very ancient, and scientists who study their evolution have long wondered what (or who) the little vampires ate before there were lots of mammals to feed on. Feathered dinosaurs apparently were among the possible creatures on the menu. The findings rely partially on amber specimens from Myanmar. In one of them, a tick is trapped in the hardened resin alongside a feather from a dinosaur that lived during the Cretaceous Period. The tick-and-feather pair support a theory that Pérez-de la Fuente had already spent years developing, based on other ticks trapped in amber from the same period. Those ticks didn’t have dinosaur feathers encased with them, but there were little hairs. The hairs resemble those left behind by a type of beetle larva that, today, lives in bird nests. “We had this indirect evidence about the relationship between ticks and feathered dinosaurs,” Pérez-de la Fuente says, but the researchers didn’t have any direct evidence for the relationship until they saw the tick and feather trapped together in amber. “The paper is a pleasant surprise,” says Ben Mans, a paleontologist who has studied tick evolution but wasn’t involved in the current study, in an email to NPR. Until now, he says, researchers assumed ancient ticks fed on the blood of early amphibians, reptiles and the ancestors of modern mammals, not on feathered dinosaurs.